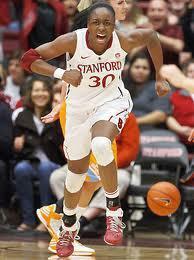 Nigerian born Stanford star Nnemkadi Ogwumike was selected with the first pick in the WNBA draft by the Los Angeles Sparks on Monday. Ogwumike helped guide the Cardinal to the Final Four during all four of her seasons at the school, including this year's loss to eventual champion Baylor. The 6-foot-2 forward, who averaged 22.5 points and 10.2 rebounds this past season, is the first Stanford player to be taken with the No. 1 pick. Previously three Cardinal players have been drafted third overall. Despite finishing with the fourth-worst record in the league at 15-19, the Sparks won the draft lottery in November. They had the smallest chance -- 10 percent -- of the four eligible teams. Los Angeles also had the top pick in 2008 and selected Tennessee star Candace Parker, who went on to win Rookie of the Year and MVP honors in her first professional season. Tennessee guard Shekinna Stricklen went second to the Seattle Storm, who will be without star Lauren Jackson for the first part of the season because she will stay in Australia to train for the Olympics. Notre Dame post Devereaux Peters went third to the defending champion Minnesota Lynx, who had five of the first 20 picks in the draft. The Lynx also picked Damiris Dantas of Brazil with the final choice of the first round. Tulsa, which had the worst record in the league last season with just three victories, took Glory Johnson fourth. Miami star Shenise Johnson was fifth going to San Antonio. Phoenix took Ohio State point guard Samantha Prahalis sixth. The New York Liberty drafted Kelley Cain seventh. Natalie Novosel went eighth to Washington, and the Mystics also took LSU's LaSondra Barrett with the 10th pick. Connecticut chose 6-foot-8 Astan Dabo from Mali with the ninth pick. Georgia Tech's Sasha Goodlett went 11th to Indiana. The WNBA season will begin May 18 with training camps opening April 29.